Multi-purpose utility lath with factory applied paper backing, for use with wood or steel frame, designed for exterior stucco application to allow metal to metal and backing to backing moisture barrier. 10 sheets per bundle, 250 per pallet. Design used almost exclusively for ceiling and soffit applications. 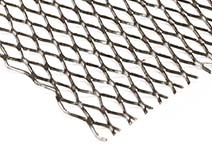 The herringbone mesh pattern allows excellent keying of the stucco to the lath for horizontal or ceiling installations spanning up to 24” o.c. Rib lath is not generally recommended for vertical or wall installations.